Chelsea have announced the signing of Mexico Under-20 international Ulises Davila from Chivas Guadalajara. The Blues have already recruited youngsters Oriol Romeu, Romelu Lukaku and Thibaut Courtois this summer and have followed that with the capture of 20-year-old attacking midfielder Davila. The diminutive Mexican has signed a five-year contract with the Stamford Bridge club. 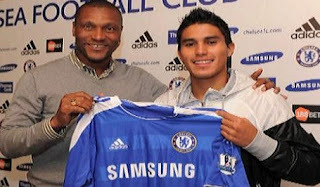 Blues technical director Michael Emenalo told the CFC website: "Ulises has been a highly-scouted player by a lot of clubs, and has made great progress in the last couple of tournaments we have seen him play in. We are delighted to have been able to get this deal done."